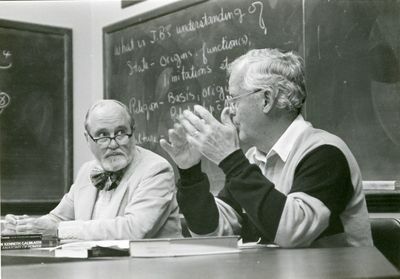 Professors Frank Nelson and Elmer Million talk in class at Linfield College. Nelson taught philosophy and Million taught history. This photo was taken in Melrose Hall. Unknown, "Frank Nelson and Elmer Million" (2014). Linfield College Archives Photograph Collection. Image. Submission 276.